The publisher of this book is Insights Editions, one of my favourite publishers. Their art books always have extra goodies, at least for the ones I bought. In this case, there are two 8” x 10” original art cards in a tipped-in-vellum sleeve and a 12-page booklet on the creation of Sindragosa. This is a paperback book and the binding doesn't look strong. Strangely, no hardcover version alternative is available. The pages are rather glossy and oily fingers will definitely leave smudges. They are given the silver-color treatment and the text printed on these silver "plates" is extremely classy. The book details the production process of the animation in great detail. There is conceptualization, story development, character development, production design and even the 3D execution. To make the book complete, they also included how they did the soundtrack and audio. On the art side, it starts off with storyboards on the introduction of Tuskassr and Lich King's entrance. Following that are pages of characters, armour, monsters, dragons and environment paintings. There's a generous amount of concept art on Sindragosa and the undead. Also included are multiple screenshots of their 3D creation process like creating matte paintings, composition, animating, rendering, etc. This book is literally packed with artwork. Blizzard has done a tremendous job with the book and with their game. They have brought together a brilliant team of artists to showcase their talent to the world. This is a stunning art book. I recommend it to all fans of World of Warcraft, or any fantasy concept artists. Great looking book, I really like the line art. i have this book, and he is very GREAT and beautiful ! The spine IS way to weak. The spine IS way to weak. Mine separated pretty quickly. It will never be the same :( A hardback book should have been made. 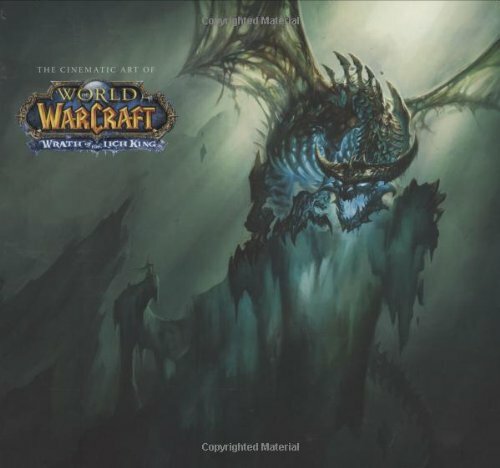 there is a hardback version but it came in the boxed set of goodies when you ordered the game DVD, its called 'The Art of World of Warcraft: The Wrath of the Lich King' its around 206 pages while the one listed above is 160pgs, though how different is the content to this one, i cant tell. Has anyone compared the two? There is a hardcover version available. I believe it was a Blizzcon exclusive.